COLTECH® TRANSELAST® is a high-built, fully aliphatic Polyurethane transparent coating providing absolute UV and light resistance, extreme durability due to high coating thickness, high elasticity preventing cracks and peel-offs, water vapor permeability in order to allow moisture to dissipate and the wood to behave naturally and extremely high resistance to alcohol, gasoline and cleaning agents. As a result, your boat deck will look new again and will be protected from the combined weather influences and heavy use. 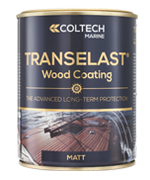 Compared with conventional Marine wood varnishes, COLTECH® TRANSELAST® will function and protect your wooden surface for many years to come without the need of grinding and reapplication. Wooden boats are permanently exposed to a combination of moisture and sunlight impact, saltwater, rain and mechanical wear conditions. The result is dried and discolored decks and other wood surfaces. The solution is offered by COLTECH® TRANSELAST® advanced long-term protection Wood Coating System. 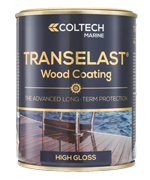 The Coltech Transelast is a transparent, hard-elastic, one component, aliphatic polyurethane, high-solids coating, used for long-lasting waterproofing and protection of wooden surfaces in marine applications. This high-technology coating is UV-stable, non-yellowing, weather stable, alkali and chemical resistant and even after aging it remains transparent and elastic. The Coltech Transelast protects and waterproofs wooden surfaces against humidity, water penetration, salt corrosion, frost, smog and acid rain. When cured it creates a permanent elastic, thick layer coating which does not blister, crack or decay as other transparent marine varnishes do. The Coltech Transelast Matt is a transparent, satin-matt, hard-elastic, one component, aliphatic, polyurethane, high-solids coating, used over the glossy Coltech Transelast for achieving a satin-matt effect for long-lasting waterproofing and protection of wooden surfaces in marine applications. This high-technology coating is UV-stable, non-yellowing, weather stable, abrasion and chemical resistant. The Coltech Transelast Solvent is a thinner (solvent) to be used in combination with the Coltech Transelast and Coltech Transelast Matt coatings.